Professional athletes are paid to perform a certain way, not look a certain way. And in the case of these 11 terrible, horrible, no good, very bad haircuts, that fact could not be more obvious. No sport is immune to players committing major style penalties. They range from crazy cuts to clashing colors. So while you’re browsing these photos and scratching your head, just remember: you are very lucky to be scratching a normal head of hair. But seriously, someone should officially ban these looks for life. 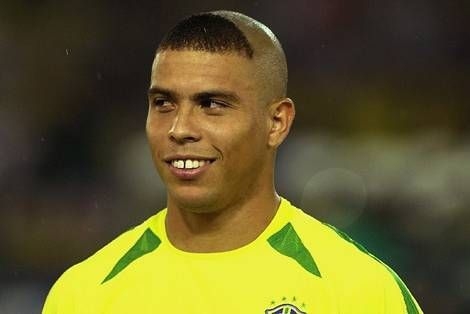 Brazilian footballer Ronaldo shaved a dome into his…dome. Most guys try to not draw attention to their hairline, especially as they get older. Brazilian football player Ronaldo is not one of those guys. In fact, at one point he made his hairline the focal point by shaving the rest of his head. He looks like he’s trying to wear one of those slimming illusion dresses on his head. Washington Nationals outfielder Bryce Harper’s hair is Bieber in the front, party in the back and who-the-hell-knows on the sides. You don’t see baseball players’ hair that often; it’s usually buried under a helmet or a hat. Bryce Harper should keep it that way until he figures out what he really wants the top of his head to look like. He has plenty of time; the guy’s only 22 years old. Is this just an adolescent phase of self-expression gone awry? Holy snap! NFL quarterback Tim Tebow tries a Friar Tuck haircut. What kind of un-Godly person would think to Photoshop Friar Tuck’s hair onto Tim Tebow’s head? I just thank God that Tebow never actually made this hairstyle choice. If this image were real, then Tebow would not have had a prayer of making it back on a NFL roster. Luckily for him, this season he will grace the Philadelphia Eagles with his presence. When your name is Kevin Grosskreutz and you partially shave your head like this, you’re asking for the “gross” jokes to flow as freely as the cider you’re swigging. So yes, Kevin Grosskreutz – German defender for Bundesliga club Borussia Dortmund – has a gross haircut.I hope there’s more alcohol where that came from so Grosskreutz doesn’t have to sit there and remember how awful his half-shaved mane looks. He looks like that tabloid picture of Britney Spears shaving her own head. Just swap Britney’s razor with Kevin’s drink. Former NFL nose tackle Antonio Garay sported this zig-zag hairdo when he played for the San Diego Chargers. This may be the worst haircut on a professional athlete I have ever seen, but not for the reasons you would expect. Yes, the black and bright turquoise zig-zag pattern across his head and beard looks ridiculous, like Mike Tyson’s face tattoo with an awful new twist. But consider this: Garay only shaved this pattern on one side of his head; his left side profile looks completely normal. Also, Garay rocked this look when he played for the Chargers, whose colors are blue and yellow; if you’re going to look ridiculous, at least have some team spirit while doing it! Someone forgot to tell NBA star Andrew Bynum that bowl cuts don’t work after you turn six. Andrew Bynum looks like someone Photoshopped his entire family into an image of a single person. You’ve got the classic dad polo shirt. You’ve got the weird hybrid bowl-cut bob that, on first glance, looks like it belongs on the head of an elementary school kid; but once you add the diamond studs to the picture, the combination starts to look like something you’ve seen on every suburban mom ever. Finally, you’ve got Bynum’s stone-faced expression, and who can blame him? If he looks up or down, he’s going to see something that doesn’t quite fit. Better to pretend it’s not happening until the next time you can get in the barber’s chair.